We recently had the opportunity to visit Baltimore as speakers at the first Baltimore boat show in which SailAmerica participated. We delivered several lectures on “Happy Hooking. The Art of Anchoring” in anticipation of the release of our upcoming book by the same title. As the lectures were only one hour per day, we had time to explore the city and report on what we found. We were suitably impressed and plan to make this trip by boat in the very near future, and certainly understand why the city is such an exciting place to host a boat show. After all, the convention center is within a skip of the inner harbor, which has plenty to offer the visitor. Click here to enlarge chartlet. 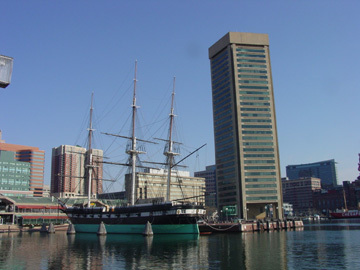 Baltimore Inner Harbor is situated in a sheltered harbor on the Patapsco River off the Northwestern Chesapeake Bay. From Rock Creek it’s about an 8-mile trip up to Fells Point in Baltimore. Follow the Brewerton Channel (Patapsco River) from Chesapeake Bay, under the Francis Scott Key Bridge, to Fort McHenry (War of 1812). Go around Fort McHenry to the starboard side, and follow the Harbor channel all the way into the city. On the way you’ll pass a special buoy that marks the spot where Francis Scott Key was held prisoner on a British ship. In the "dawn's early light" he saw the American flag still waving over Fort McHenry and it inspired him to write the "Star-Spangled Banner", our national anthem. It is a very boat friendly port. It is loaded with marinas and has several places to anchor. The Inner Harbor Marina is the last one on your port side. Look for the Rusty Scupper Restaurant and fuel signs. This is the place to be if you want immediate access to the city. (If only every city had such easy access!) It was extensively renovated in 2006-2007 and now offers first rate facilities. If you are looking to anchor, after checking out the tiny little anchorage in the Inner Harbor proper, you may want to head to the anchorage adjacent to Henderson marina in Fells Point. It is very conveniently located near a dinghy dock, a Safeway and a West Marine. The Port of Baltimore was established in 1706 and is one of America's busiest deep-water ports. Its 45-mile shoreline supports many terminals for commercial trade, as well as public and private cargo terminals. 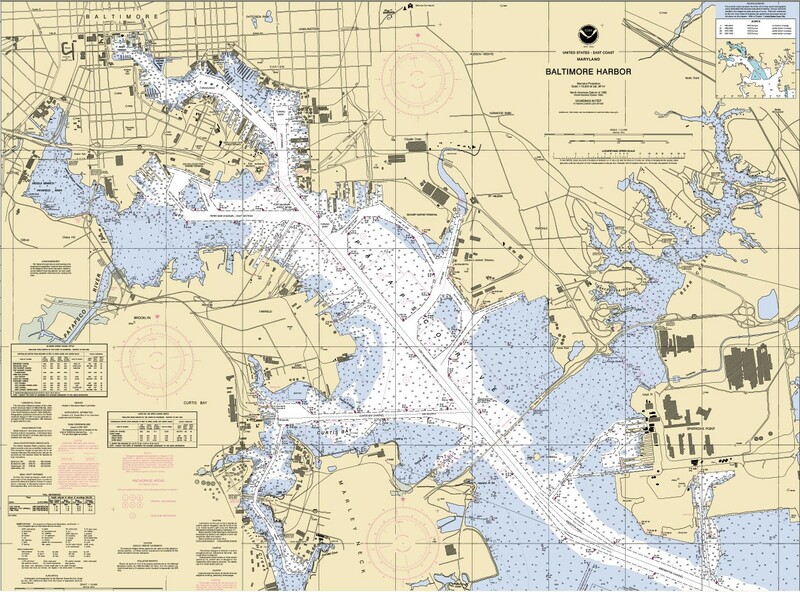 In 1990, the main shipping channel from Cape Henry to Fort McHenry was dredged to a depth of 15 m (50 ft), allowing deeper-draft vessels entry to the port. In addition, new terminals were constructed, and public and private marine terminals were expanded. The improvements also included deepening and widening portions of Anchorages #3 and #4. 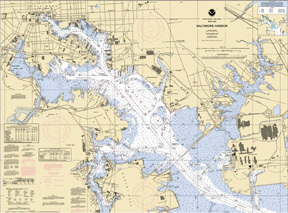 Baltimore Inner Harbor boasts several world-class marinas and one top-rated service and repair yard for boats and yachts. The lightship Chesapeake with the aquarium rising above it in glass. From the National Aquarium and marine historical exhibits to world class food, shopping galore and even a science center, there is something to please everyone. There are hsitoric vessels to visit right on the harborfront, historic homes to view along the water, underground railroad stories to discover, and shipbuilding legacies to explore. So much happened in Baltimore over the centuries of our countries history that it's hard not to discover lots of interesting historical tales. Ironically, although there is much historical memorabilia to pursue in the inner harbor, much of the construction is actually new. Part of the reason is that a good deal of the original housing was detroyed in preparation for a planned interstate route that never happened. The caretakers of this city have done a remarkable job bringing it back from the brink in a pleasing and exciting way. The waterfront is bustling, the neighborhoods are once again full of character, and the marinas abound at every turn. You can find just about anything you need to support your boat, satisfy your spirit, and nurture your curiosity. And if that wasn’t enough, go in search of ghosts in the charming historic community of Fell’s Point. Fell's Point was spared the wrecking ball and actually has managed to preserve much of the original waterfront housing from centuries past. In fact, cruisers will find a nice sheltered spot with access to all the amenities cruisers need there, all with the ambiance of an 18th century village. Whether you want to spend time at a marina in the heart of the city or in an anchorage embraced by a charming seaside village, we don't think you will be disappointed with a visit to Baltimore. Fell's Point clockwise from top left: Thames Street restaurants, working dock at head of Broadway at Thames home to water taxi and tugs, upstairs restaurant and pub at Slainte from where the prior photo was taken, and view up Broadway to the market. The brick promenade invites a stroll along the inner harbor. ESPN Zone, Barnes & Noble, and other fine establishments inhabit waterfront factories restored for modern use. Historic Fells Point has long been a favorite attraction and in fact presents a second harbor choice in the vicinity. At the very foot of Broadway, you’ll find an eclectic collection of stores and boutiques scattered throughout, as well as a historic market in the center square of the village. Though just blocks from the Inner Harbor, it has a small town feel with individually owned and operated businesses. Fell’s Point was established in the early 1700s when William Fell, an English Quaker, bought land here. Some of the oldest surviving residences and a pre-revolutionary coffee house can still be found along Thames Street. There were plenty of firsts. 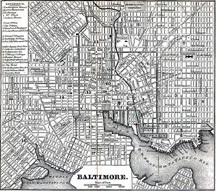 The first Black owned railway was founded here, the first frigate of the Continental Navy, the Virginia, was built here by the Fell’s Point Ship Yard, followed by the Baltimore Clipper, the Constellation, some 22 years later, and the first horse drawn street car in Baltimore started and ended here. Frederick Douglas lived here 1826-1838 until he escaped to freedom from slavery in the North. Many of the privateers that plied the waters in the War of 1812 were built and anchored here. In fact there were so many colorful characters here that you can step through the doors of some of Fell's Point's most haunted pub and if your arms break out into goosebumps, and the hair on your neck stands up, it may be because ghost sightings have happened right where you are sitting. One of the ghost sightings has reportedly been confirmed as the son of William Fells, who apparently couldn’t bear to leave his beloved tavern. Rumor has it that footsteps are heard clearly and cash registers fly open in good-natured bantering of the living. You can certainly imagine it here in the historic heart of Baltimore. Many of the old buildings including the can factory have been turned into high end housing developments, with slips and waterfront parks. All in all, it’s a great place to visit and seems like a great place to live as well. Bridges span the inlets that dot the waterfront. With its cobbled stone streets, brick and stone front buildings, and its waterfront location, you'll find a charming selection of shops, pubs, restaurants, and night clubs. From casual to fine dining, and from sports to jazz, there's always something for everyone's taste. New development occurs all around the community, yet there still exists a small town feel in the neighborhood as the majority of the businesses are locally owned and operated and all you need can be found right there. And with the tug service still operating from the docks at the head of the main street, the working harbor preserves some of the character of bygone eras. 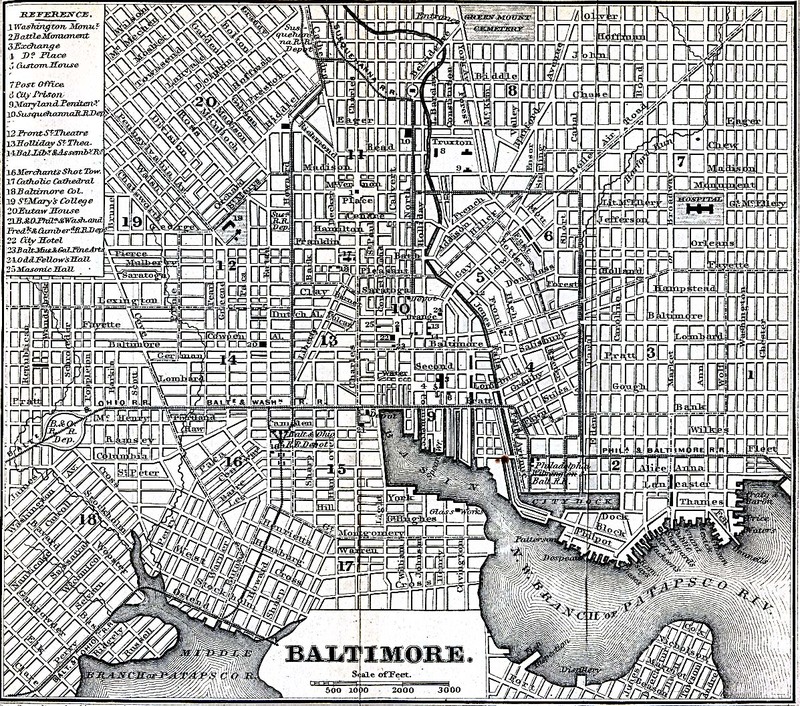 Interestingly, in the 1970s, Baltimore announced plans to run a new highway link from I95 directly through Fell’s Point which would have obliterated the community. The citizens took it upon themselves to stop the development and had Fell’s Point listed as Maryland’s first National Historic District. Since then the movie “Tin Men” and the NBC series “Homicide  Life in the city” have brought the district to the light of many. There is also a water taxi that can take you right to the Inner Harbor. Tie up directly to the bulkheads of the main piers is available, as is transient space in several marinas along its ample water frontage. Perhaps the most wonderful part for boaters preferring to remain at anchor than at the docks, the anchorage is protected and secure with good holding as well as access to shore via a very respectable dinghy dock that lands you across the street from the supermarket for major provisioning possibilities. From here, it is just a short walk or dinghy ride to the main square. Chessies line up waiting to take visitors for a spin around the harbor. There are many fine restaurants in the vicinity of the Inner Harbor. The hotels each have major restaurants and there are plenty of alternatives. McCormick & Schmick’s is famous for seafood, as is Phillip’s, both on the waterfront at opposite ends of the harbor. Fogo De Chao Churrascaria across from the waterfront is a classic Brazilian restaurant with $45 pp all you can eat meat delivered every time you turn your chip over at the table. Come hungry. The lines are long, the food is good and endless. In Fell’s Point, Kooper's Tavern and Slainte Irish Pub are two great choices. The rooms upstairs have great views of the harbor from above and tasty food to offer. Try the crab cakes at Koopers and the Oyster Po Boy at Slainte next door. Great pub atmosphere abounds. As alternatives try Ale Mary’s (they have Wi-Fi), The Admiral’s Cup, The Horse You Came in On and the Waterfront Hotel -- all on Thames Street. Broadway has many more watering holes with good food and good spirits to keep you busy for days. With names like Wee Peters, The Whistling Oyster and the Wharf Rat, you won’t have trouble conjuring up colorful images of the past. "Best Service Yard - Harbor & Chesapeake Bay"
"Best place to dock - South Shore"
Baltimore Water Taxi has a great website with loads of information about Baltimore, including the stops and schedules for water taxi service, restaurants, maps of the Inner Harbor and Fell's Point, links to all the local attractions and more. Very simply done and a great resource. Plan on at least 1.5 hours to see the majority of the aquarium exhibits, moving pretty quickly through. Sharks, rays, dophins, turtles, reef fish, corals of every variety, reptiles, you name it are here in “native” habitat. It is extremely well done, and progresses up through a beautifully arranged glass structure that ends up in the canopy of a rain forest where the cycle for all aquatic life begins. There is even a three-toed sloth which I believe we saw hanging out in a tree. The National Aquarium is a real national treasure. Very well done. The Baltimore Maritime Museum maintains several vessels, including the submarine, the lightship, the USCG cutter, and the screwpile lighthouse. The WWII submarine, you can hear it preparing to “Dive, dive, dive” all day long. Camden Yards, home of the Orioles, is walking distance from the Inner Harbor  catch a game while you are in town! Walking Tours of Fell’s Point  or try the ghost tour instead! The Fell's Point Festival in early October every year brings more than 700,000 visitors over the course of two days. The Preservation Society of Fell's Point Ghost Walk. The Inner Harbor is a little more challenging for provisioning. There are plenty of restaurants but few markets. It is easy to find take out but not easy to provision. Fell's Point on the other hand is a snap for provisioning and pub crawling. Safeway in Fell’s Point (the opposite direction from the center of town than Baltimore Inner Harbor) is directly across from the public dinghy dock. There is also a West Marine just down the street. Broadway Market in Fell’s Point is great for fresh vegetables. And of course Thames Street and Broadway both have a full selection of eateries just waiting to be explored.